The New York Yankees and the Boston Red Sox have been battling back and forth ALL season and this series was going to add some SEPARATION between the two teams and that is EXACTLY what happened this weekend, but NOT in the favor of the Yankees. This weekend was a DISASTER for the Yankees, after leading by FOUR runs in the SECOND inning in the FIRST game of the series, the Yankees were SHUT DOWN and were TRASH for the rest of the weekend. The Red Sox SWEPT the series and now lead the AL East by TEN games and are going to RUN AWAY with the division. For the Yankees, this weekend is FURTHER proof that they are going to be a Wild Card team and it is a BLESSING in DISGUISE as they can now REST their players and be fully HEALTHY for the AL Wild Card game, as them winning the division this year is IMPOSSIBLE. Game 1- CC Sabathia has been GREAT following Yankee losses and they were coming off a LOSS against the Baltimore Orioles on Wednesday before heading NORTH to Boston. CC was EXHAUSTED in the HEAT of Boston and he did NOT survive past the THIRD inning, which sent this series in SHAMBLES. 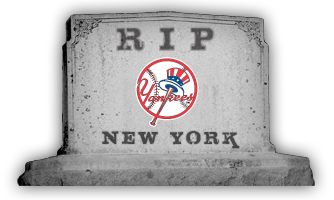 The Bullpen, specifically Jonathan Holder IMPLODED in the FOURTH inning and that might have the NAIL in the coffin for the Yankees in terms of WINNING the AL East this season. Holder was charged with SEVEN runs without registering an OUT on Thursday Night. Didi Gregorius is a CLUTCH player and he got the Yankees an EARLY 3-0 lead on a THREE run Home Run in the FIRST inning and after an Aaron Hicks Home Run in the SECOND inning, the Yankees were CRUISING with a 4-0 lead, but that is when the TIDES turned. The Red Sox scored ONE run each in the SECOND and the THIRD inning before scoring EIGHT in the FOURTH inning to take a 10-4 lead and it seemed that the Yankees were DEAD after that. The FINAL score of the game was 15-7, but I was NOT really watching the game at that point. Game 2- After a DEVASTATING loss on Thursday Night, the Yankees had their ACE on the mound on Friday Night. Luis Severino had been TRASH in the month of July, but he could TURN the page in the month of August and show why he is the ACE of this team, BUT he did NOT do that. Sevy gave up THREE runs in the FIRST inning and things were going the same way for the Yankees as they did on Thursday night after the FOURTH inning DEBACLE. The FINAL score of the game was 4-1, but AGAIN I was NOT really watching the game at that point. Game 3- The Yankees were put in a SCRAMBLE thanks to TERRIBLE starts by Sonny Gray and CC Sabathia on back to back nights. J.A. Happ was SLATED to pitch the game on Saturday, but he was put on the DL with Hand Foot and Mouth disease, so Lance Lynn COULD have made the start on Saturday, but he had to pitch in relief of Sonny Gray on Wednesday, so he was UNAVAILABLE for Saturday’s game. After Happ AND Lynn being UNAVAILABLE on Saturday, the Yankees called up Luis Cessa on Thursday to POSSIBLY start on Saturday, but he had to pitch in relief of Sabathia on Thursday, so he was ALSO unavailable to pitch on Saturday. After boiling out ALL of their options, the Yankees turned to Chance Adams, who was ONCE the BEST pitching prospect in the Yankee Farm System, but he has been trending DOWNWARDS over the last TWO seasons. Adams was the ONLY pitcher in the Yankee system available to pitch on Saturday and so he was called up to make his MLB DEBUT in Fenway Park against the Red Sox in a game that the Yankees HAD to win if they want to WIN the AL East this season. Adams gave up a TWO run Home Run in the FIRST inning, but he was PHENOMENAL for the rest of the game and gave up only THREE runs in FIVE innings. The Yankees have NOT decided if Adams is going to stick around in the Majors or this was just a SPOT start for him before Happ gets back. The Yankee offense had gone COLD again for the SECOND game in a row and DESPITE having the Game TYING run ON BASE in the NINTH inning, the Yankees LOST the game 4-1, thus ENSURING that they had LOST the series and fell 8.5 games OUT of FIRST place. Game 4- David Price has been TRASH against the Yankees, so the Bombers could be CURED against him last night. Price was GREAT to begin the game, but he CAVED and gave up a TWO spot and the Yankees were leading 4-1 going into the BOTTOM of the NINTH, but the Red Sox proved that they are going to WIN the World Series this year, they came BACK to TIE the game and then WON the game 5-4 in the TENTH to END a DISASTROUS weekend for the Yankees. Masahiro Tanaka got the start for the Yankees and he was GREAT once again. He has to stay in games LONGER and he might be the team ACE that pitches the AL Wild Card game for the Bombers. There were NO positive signs from this weekend so there is NOT really analysis, since EVERYONE and EVERYTHING that wears a Yankee uniform is TERRIBLE right now. Yankee fans are BLAMING manager Aaron Boone for this mess, but that is just LAZY. Boone is making the lineups that the Front Office is giving him and he is putting his players in the BEST position to WIN, but the players are letting him and Yankeeland DOWN so it is NOT really his fault. The next TWENTY FIVE games for the Bombers are against teams that are UNDER .500 so if the Yankees can DOMINATE these games than they might be able to get back in the AL East division race. The games against SUB PAR teams starts this week in Chicago against the White Sox and the Yankees HAVE to WIN tonight and WIN the series or else there might be a RIOT outside Yankee Stadium.